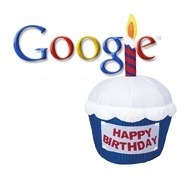 Google marked its 11th birthday yesterday. To celebrate, theEword reveals 11 facts you probably didn't know about the search engine. 1 Google was originally named 'BackRub'. According to Stanford University's David Koller, the ubiquitous moniker by which we know it today was actually born as a result of a simple misspelling. Having settled on the name 'Googol' (10 to the power of 100), Sean Anderson, a colleague of Larry Page, checked to see if the domain was available. However, he mistakenly searched for 'google.com', which he found to be free. Larry Page liked it and the name stuck - the domain was registered on 15 September 1997. 2 Google's first office was based in a garage in Menlo Park, Califoria. The home was owned by Susan Wojcicki, now the vice president of product management for the company. 3 Google first entered into the dictionary in 2006 as a verb, meaning to look for information on the internet using the search engine. 4 Google's most expensive acquisition was the digital ad firm DoubleClick in 2007. The deal cost $3.1 billion. 5 Google has a Manchester office. A very small arm of the company has been located in a building on Oxford Road since 2005. 6 Google Labs gives users the opportunity to give feedback on prototype programmes and applications. Google Maps was first showcased in this way. 7 PageRank - the value Google assigns to website pages – is named after the Google co-founder Larry Page. A patent awarded to Stanford University cites him as the inventor. 8 The company uses Google Mail for all internal email. 9 Google employees are encouraged to spend 20 per cent of their time on an external project. Google News and Google Mail were both conceived and created in this way. 10 Google regularly changes its homepage logo to reflect historical events and celebrations on certain days. Dennis Hwang, a 28-year old webmaster at the company, designs the different images which occasionally grace the top of the site. 11 It has been awarded the 'best company to work for' accolade by Fortune Magazine in both 2007 and 2008. Many of the company offices have an onsite doctor, dentist and massage room.